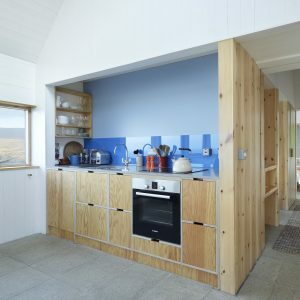 Tinhouse is a unique, architectural award winning luxury holiday cottage for two. 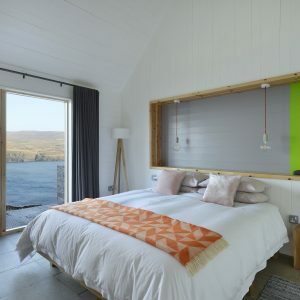 Located in North West Skye it is ideally located for foodies, walkers, or simply for those that want a secluded break in the extraordinary landscape of the Isle of Skye. 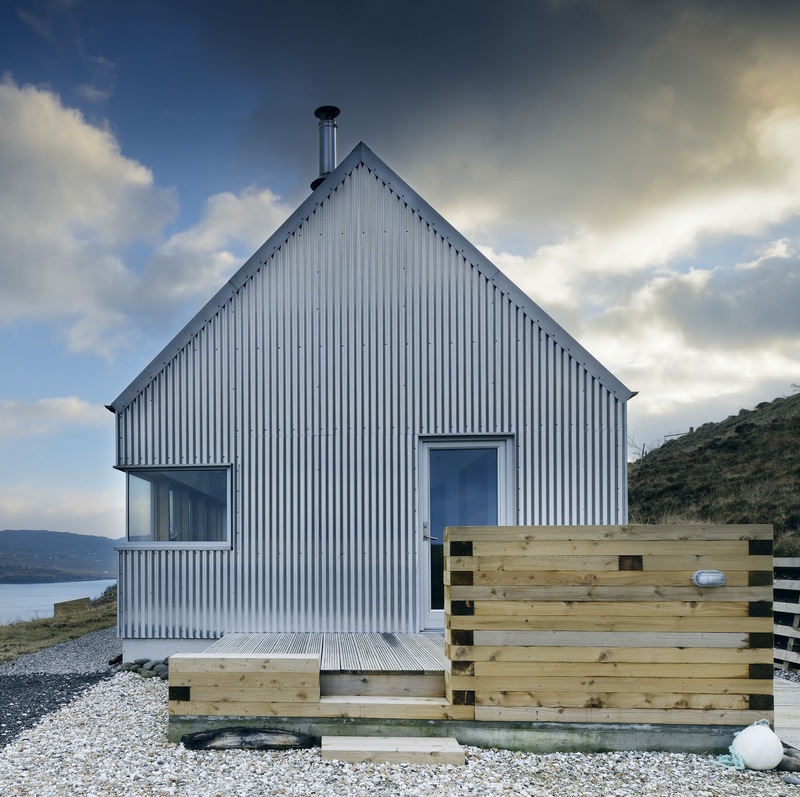 Finished with the highest quality furnishing and fittings, the house exudes a relaxed style, and enjoys a panoramic view over the seascape of north west Skye. 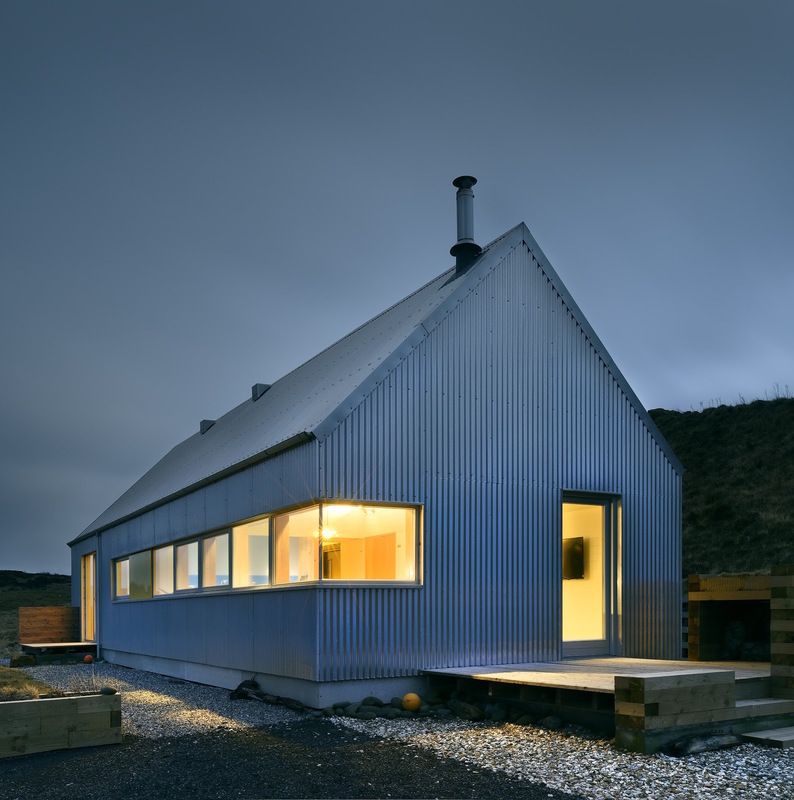 Tinhouse has been designed and self-built by the owners. Gill and Alan run one of the highlands most succesful architectural practices, whose work is regularly profiled in the press and regularly wins architectural awards . 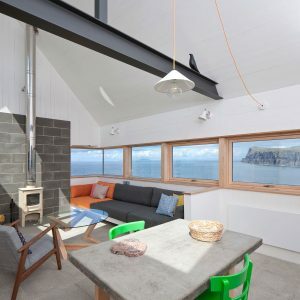 An open plan living, dining and kitchen space features a panoramic window over an open view of the sea, the cliffs and the distant islands. The summer sunsets are something that memories can be made of. Inside you will find a log burner, built in sofa, and a fully fitted kitchen. The bedroom also features a cathedral ceiling , king size bed, and once again a beautiful view. 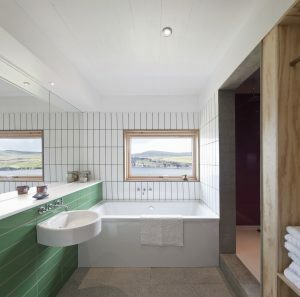 The bathroom comprises a separate double bath and shower. The house will have all you need for your holiday. WiFi, bluetooth/airplay music system and a large screen Smart TV. Fully fitted kitchen (including dishwasher, full light fridge freezer etc) together with separate laundry cupboard with washing machine and drying pulley. The bathroom incorporates a large bath and a separate shower. Towels are provided and the Super King size bed has beautiful Egyptian cotton sheets. We cannot guarantee beautiful sunsets every week, however the landscape never fails to captivate, whatever the time of year. A few non perishable “basics” are provided as a start to your holiday, together with a starter pack of logs, kindling and firelighters for the woodburner . A couple of surprises will also be waiting for you when you arrive. 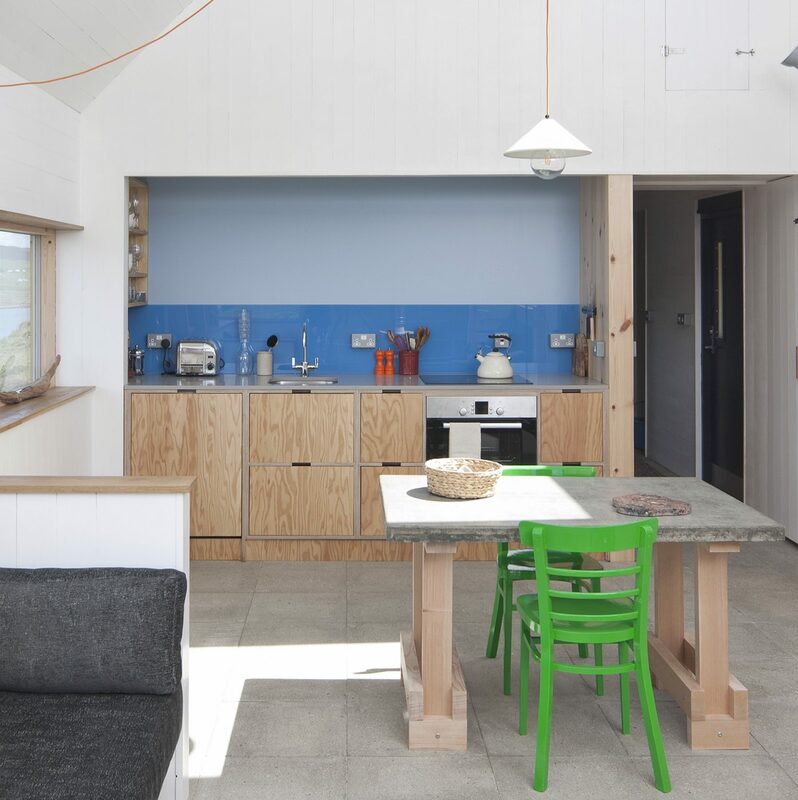 Tinhouse is purpose designed for couples, we cannot accommodate children or pets. The house is also very strictly no smoking. Bookings are confirmed with a deposit of 50%, the balance payable 4 weeks prior to booking. Payments can be made via Worldpay or alternatively by a direct bank transfer. Availability is from Saturday – Saturday only. Entry is any time from 4.00 on the Saturday of arrival. Please read our reviews at the bottom of this page. This is our favourite place we have ever stayed! 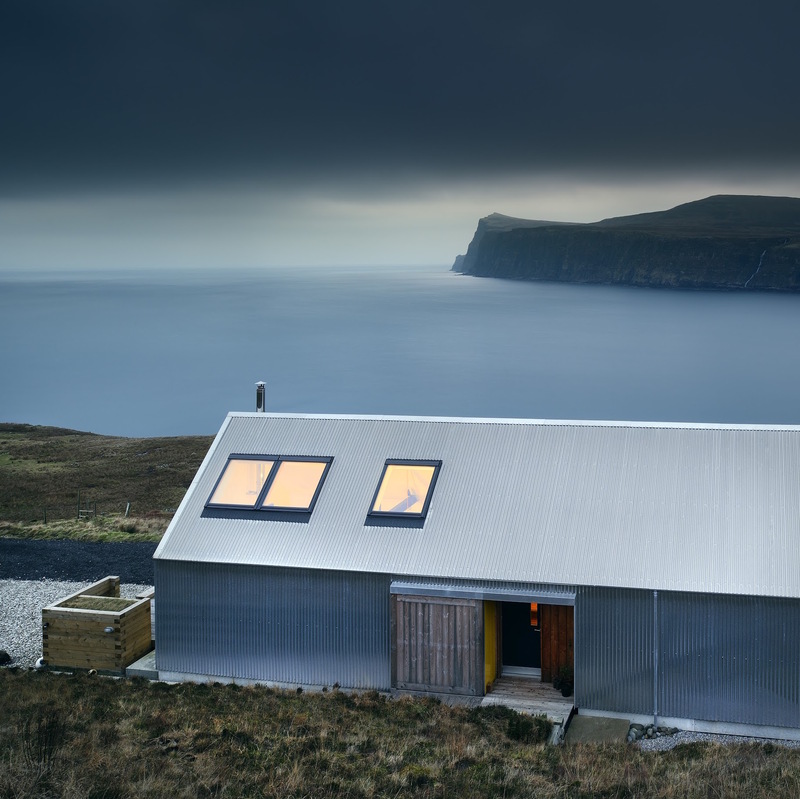 The views from The tinhouse are spectacular and we loved watching the weather, waves, colours changing. 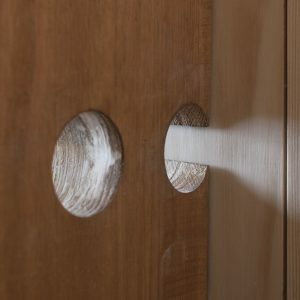 The design of the tinhouse is beautiful and also very practical, such a calm environment and a real breath of fresh air. The house has many thoughtful touches and really has everything you could need. We were thrilled to see so much wildlife during our stay- Dolphins, minke whales, stag, sea eagles … An unforgettable location and stay! Thank you!! This place is simply stunning! 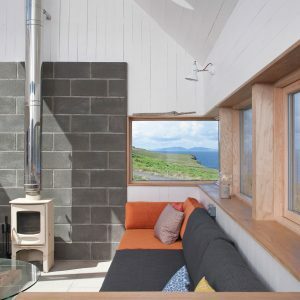 If you are looking for that remote getaway on Skye, then stop looking for anywhere else. Inside, this is a premium quality space – modern and spacious, well appointed, cosy. Outside, the views are just incredible. You will not get tired of looking out across the bay to the cliffs beyond. From the window, we saw a red deer stag (in the garden! ), seals swimming past down by the shore, and lots of birds including a sea eagle. You can walk along the cliffs right from the house. 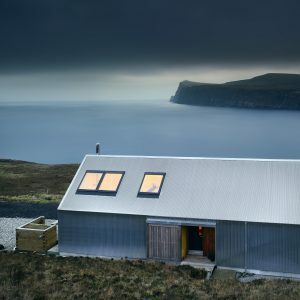 Neist Point and Waterstein Head are only five minutes drive away. There are plenty of maps and guidebooks to inspire you. This is remote, so most other parts of Skye are a fair drive to get to, but the benefit is that you are far away from the (other) tourists! Just remember to pick up all your groceries and supplies; it’s a bit too far to just “nip out” for something. The kitchen is well appointed (has all the utensils that so many holiday rentals lack), but there is no microwave. There is a massive TV, which also has Netflix, and the internet speed was decent for somewhere so remote (fairly consistent 3mbps download). The bed is big and comfy, the bath is deep and fills up quick, and the walk-in shower is just a pleasure! Alan was very friendly, and the welcome package was unexpected but most gratefully received! 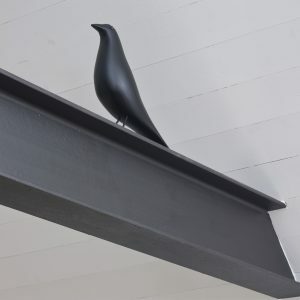 There is so many other nice touches in the Tinhouse… I considered listing them but that will spoil the surprise of you discovering them for yourself! 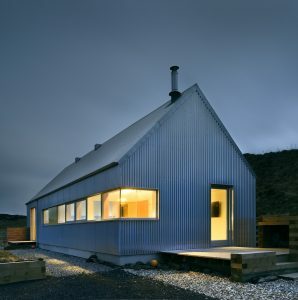 You can tell that building this house was a real labour of love. Stunning! Do it! This BY FAR the best I have ever stayed in; and moving forward it will be very difficult for anywhere in the future to come close. From the moment we walked through the door it was breathtaking. 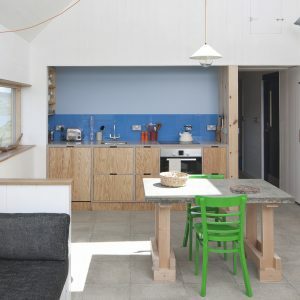 The space is designed incredibly well and you can tell that Alan and Gill spent a lot of time thinking about everything as it was all so well planned and positioned. 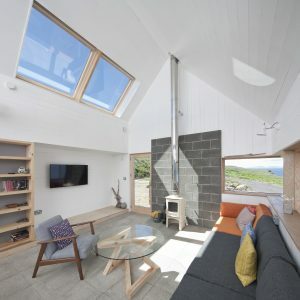 Location is amazing, waking up to the views of the sea and the Outer Hebrides on a clear morning was just unreal. Perfectly positioned for exploring Skye, we did all the main walks and had wonderful evenings with the log burner watching Netflix! 100% would recommend and have told all my friends and colleagues to book here as soon as possible!